Most families don’t have the time to spend hours making dinner every night. And since going through the drive-thru isn’t the healthiest or most cost-effective dinner solution, taking a few small and simple steps to make dinner at home will benefit both your wallet and waistline. In fact, a healthy and delicious dinner that will satisfy even the most finicky in your family is just a couple of chops, stirs and mixes away. Do some prep work on the days when you have a bit more time on your hands. Before making a trip to the grocery store, decide on at least three meals you would like to prepare throughout the week. Then compile a list of ingredients so you’re not left aimlessly wandering up and down the aisles. 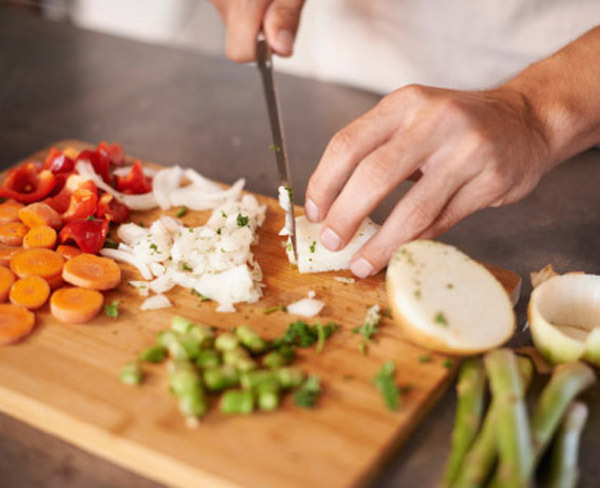 Once the groceries are unloaded, spend just an hour or two completing the time-consuming cooking chores like chopping veggies for a stir-fry, mixing together a large batch of marinade to be used for meat, fish or chicken dishes, or cooking grains for a casserole. Store cut-up vegetables in plastic bags, keep grains in glass containers, and use an empty jam jar to house the marinades or sauces. All of these items will stay fresh in the refrigerator for a few days. The trick with making dinner easy is to have as much of the meal prepped ahead of time so that all you have to do is add a few extra ingredients, heat and serve. For those evenings when you don’t have a meal planned, turn to ingredients that you already have in your kitchen. Ask any chef about their must-have cooking staples and they are likely to rattle off a small list of tried-and-true ingredients that can be quickly prepared and added to any dish to boost flavor and appeal. Whole-grain pasta, fresh Parmesan cheese, herbs like basil or rosemary, canned beans, and a good quality tuna fish can provide the basis for numerous simple dinners. Consider these as the foundation of your meal and build from there. In addition, quick-cooking grains like couscous and quinoa, and bags of frozen veggies or ready-to-serve salad greens easily round out a main dish.